Necromunda is "deprecated" and forgotten by Games Workshop. Many miniatures are no longer available and those still in stock are expensive, so Deadzone serves as a good source of squads, plus I get to choose if to use Necromunda or Deadzone rules. I loved the modular scenery idea. Not having any Necromunda-like scenery my scenarios would be quite limited, and with Deadzone I have quite some options now. Some of the miniatures are also quite awesome (Enforcers, some Plague models, Orks/Marauders...) so even if I don't enjoy the rules, I still get quite a few cool minis to paint (some day...). So, while I wait for the second shipment of the kickstarter (zombie miniatures and the Forge Fathers/Squats 5th faction), I've been busy this days assembling all the scenario and some of the miniatures and this are my thoughts. First of all, I pledged for a Strike Team. 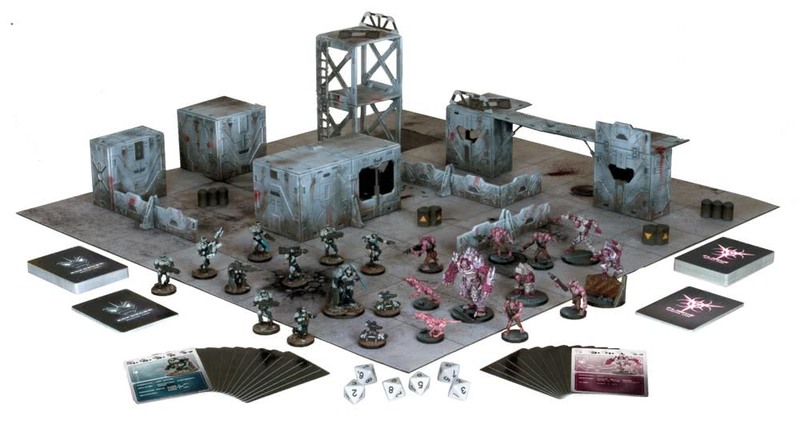 For 150$ you get the starter box (see photo below, Enforcer & Plague factions, scenery, rules, etc. ), plus Rebs faction, Marauders faction, a fifth faction (I choose Forge Fathers), some zombies, a nice gaming mat and some extra scenario sprues. All the miniatures and scenario come in hard plastic. No assembly instructions included. So far, miniatures I've assembled come with some moulds and require a low-to-med amount of cleaning work, but overall are better than Sedition Wars ones. The amount of detail is great, and as expected some of the minis are fantastic. I still have lots of plastic bags to open and assemble but looks near 50 miniatures on the 1st shipment. Scenario is also hard plastic, in different sprue types containing walls, floor/ceilings, corridors, doors, windowed walls, and accessories like barrels, boxes and ladders. There are also two sprues with the "connectors", small pieces that allow to join walls/bases/barriers either adjancent or with a 90º angle. This are some photos of most of the buildings I decided to make. The bridges are not glued to any building so I can put them anywhere. I also did some horizontal and U shaped barriers. I used most of the pieces. Regarding the buildings, while there were a lot of sprues, you must decide if to make lots of small buildings, or fewer but bigger or taller ones. I built 4 1x1 small ones, two 2x1, a 3 stories tall one and a "small landing pad" that allows to place a building over it and acts as an elevated building with cover. Plus three barriers and two bridges. They are hard-plastic, but because if the previous issue, it is far from easy to detach them once joined. I broke 3 or 4 this way, and ended up planning a lot every connection before making it. There are way too few of them. In order to make all my desired buildings, I had to only use one connector per "side" instead of two, so the joints are half as firm as they could be. Red areas in the photo below were left without connectors (green areas). And despite that optimization, I barely had enough for everything. At least the kickstarter pledge should contain an extra sprue of connectors. Also this means you must glue all pieces to improve stability and avoid pieces breaking/unjoining. Overall, I'm pretty happy with the results. I now have 5 squads (containing the Escher Necromunda one), lots of scenery and two game rules to apply with them, and I'm still pending more minis. The base game might be a bit pricey when launches (around 14 miniatures and less building sprues) but I think the kickstarter was worth it.